The National Academy of Medicine announced yesterday a first-of-its-kind collaboration with Johnson & Johnson Innovation as the principal corporate partner of the Healthy Longevity Catalyst Awards in the United States. The Catalyst Awards are part of the Academy's Healthy Longevity Global Grand Challenge, which aims to create a worldwide movement to improve physical, mental, and social well-being for people as they age. NAM President Victor J. Dzau and Johnson & Johnson's Global Head of External Innovation William N. Hait formally signed the agreement during a ceremony held April 16, 2019, at the National Academy of Sciences building. Harry T. Edwards and Constantine Gatsonis, co-chairs of the committee that authored the National Academies' 2009 report Strengthening Forensic Science in the United States: A Path Forward, have been awarded the Innocence Network's 2018 Champion of Justice Award. Judge Edwards accepted the award at the annual conference of the Innocence Network. The award "was created to honor individuals who go above and beyond in supporting and championing efforts that free the wrongfully convicted, and/or reform the criminal justice system to prevent wrongful convictions. Their work strengthens the integrity of the justice system, is imbued by their sense of fairness and professionalism, and demonstrates a lasting dedication to the fair execution of the law." The award pays tribute to the National Academies' report on the 10th anniversary of its publication. (See a timeline of report impacts.) In notifying Edwards and Gatsonis about the award, the Innocence Project thanked the committee for the report, "which has truly transformed the state of forensic science and the involvement of the research community in service of criminal justice reform." Cherry Murray, a member of NAS and NAE, and Peggy Hamburg, NAM member and foreign secretary, have been elected as co-chairs of the InterAcademy Partnership (IAP) at the IAP General Assembly in Songdo, South Korea. IAP is the global network of over 140 science, engineering, and medical academies working together to provide independent, expert advice on scientific, technological, and health issues. Over the course of her career in physics, Murray has held prominent appointments in industry, academia, and the public sector, while Hamburg is a distinguished physician and public health administrator as well as president of the American Association for the Advancement of Science (AAAS). Murray and Hamburg were nominated by NAS President Marcia McNutt and NAM President Victor Dzau, respectively. The U.S. Department of Veterans Affairs should expand the requirement in its disability compensation process regarding who can diagnose traumatic brain injury (TBI) to include any health care professional with pertinent and ongoing brain injury training and experience, says a new congressionally mandated report from the National Academies of Sciences, Engineering, and Medicine. Currently, one of four specialties must diagnose TBI — a neurologist, neurosurgeon, physiatrist, or psychiatrist — but the report says that it is the training and experience, not necessarily the medical specialty that renders a health care provider capable of an accurate diagnosis. 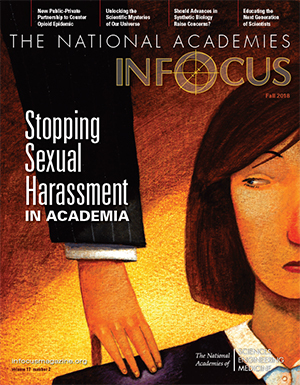 National Academies have joined with over 40 colleges, universities, and research institutions to launch an Action Collaborative on Preventing Sexual Harassment in Higher Education. The purpose of the action collaborative is to bring together academic leaders and key stakeholders to prevent sexual harassment across all disciplines and among all people in higher education. The action collaborative is designed to be an active space where colleges, universities, and research and training organizations can research and develop efforts that move beyond basic legal compliance to evidence-based policies and practices for addressing and preventing all forms of sexual harassment. National Academy of Sciences President Marcia McNutt and Israel Academy of Sciences and Humanities President Nili Cohen signed a historic cooperation agreement yesterday to benefit outstanding scientists in both countries and to formalize cooperative relations between the two countries' scientific communities. The signing took place in the presence of Reuven Rivlin, president of the State of Israel. Under the terms of the agreement, annual national scientific conferences with the participation of dozens of leading scientists will take place alternately in Israel and the United States. The accord also provides for annual binational exchanges of eminent scientists and scholars, who will hold meetings and seminars at local academic institutions and deliver public lectures. A new report from the National Academies examines the effects and efficacy of using dispersants in marine oil spill response. Dispersants reduce oil at the water's surface by promoting the formation and diffusion of small oil droplets that may biodegrade more readily. Field and modeling studies show that dispersants can be a useful tool for oil spill response, the report says. By reducing the amount of surface oil, dispersants can reduce response personnel's potential exposure to hazardous compounds in oil and lessen the extent of surface oil encountered by marine species. Urban flooding is a complex and distinct kind of flooding, compounded by land use and high population density, and it requires a different approach to assess and manage, says a new report from the National Academies of Sciences, Engineering, and Medicine. The report calls for multi-agency and cross-jurisdictional efforts to assess urban flood hazards, advance understanding of social impacts, and effectively communicate urban flood risk. Current evidence supports the classification of the contemporary red wolf as a distinct species of wolf, although additional genomic evidence from historic wolf specimens could change that assessment, says a new National Academies report. It also concludes that the Mexican gray wolf is a valid subspecies of gray wolf. The Gulf Research Program of the National Academies of Sciences, Engineering, and Medicine today announced a new funding opportunity under its Healthy Ecosystems Initiative. Up to $5 million is available to fund research projects that will improve understanding of how coastal ecosystems in the U.S. Gulf of Mexico region are affected by or interact with natural processes and human activities for the purpose of informing natural resource decision-making and management practices. Although three U.S. Food and Drug Administration-approved medications to treat opioid use disorder (OUD) are safe and effective, most people who could benefit from these treatments do not receive them, and access is inequitable, especially among certain subpopulations, says a new report from the National Academies of Sciences, Engineering, and Medicine. Medications for Opioid Use Disorder Save Lives says that withholding or failing to have available these medications for the treatment of OUD in any care or criminal justice setting is denying appropriate medical treatment. A new report from the National Academies recommends steps U.S. communities can take to better measure their progress in building resilience to disasters, including measuring resilience around multiple dimensions of a community, and incentivizing the measurement of resilience. The report also recommends that the National Academies' Gulf Research Program develop a major, coordinated initiative around building or enhancing community resilience across the Gulf of Mexico region. Established in 2002, the Abel Prize recognizes contributions to the field of mathematics that are of extraordinary depth and influence. The prize amount is NOK 6 million. Visit Abelprize.no for more information on the prize. Two Grainger Foundation Frontiers of Engineering Grants of $30,000 each have been awarded to attendees of the National Academy of Engineering’s 2018 U.S. Frontiers of Engineering Symposium. The grants provide seed funding to enable further pursuit of important new interdisciplinary research and projects stimulated by the symposia. In response to a commentary in Nature that calls for a moratorium on clinical uses of heritable genome editing and the establishment of an international governance framework, a statement by the presidents of the National Academy of Medicine, National Academy of Sciences, and the Royal Society says that the commentary "underscores the urgent need for an internationally accepted framework that addresses these complex scientific, ethical, and societal issues. "Toward that end, the U.S. National Academies and the Royal Society are leading an international commission to detail the scientific and the ethical issues that must be considered in planning any genome editing, and to define specific criteria and standards for evaluating whether proposed clinical trials or applications that involve germline editing should be permitted." The president of the Russian Academy of Sciences and the presidents of NAS, NAE, and NAM have signed a five-year agreement to continue their cooperation on studies, workshops, and other activities in areas of mutual interest, marking 60 years of cooperation between the Russian and U.S. academies. The current measles outbreaks in the United States and elsewhere are being fueled by misinformation about the safety of vaccines. To help counter such misinformation, the National Academies of Sciences, Engineering, and Medicine created a website that provides clear, concise, and evidence-based answers to questions about vaccine safety and other commonly asked questions about health and science. The evidence base includes a number of our studies examining vaccine access, safety, scheduling, and possible side effects. Our work has validated that the science is clear — vaccines are extremely safe. The Editorial Board of the Proceedings of the National Academy of Sciences has selected six papers published by PNAS in 2018 to receive the Cozzarelli Prize, an award that recognizes outstanding contributions to the scientific disciplines represented by the National Academy of Sciences. Papers were chosen from the more than 3,200 research articles that appeared in the journal last year. Marcia McNutt, president of the National Academy of Sciences, spoke to the U.S. House Science, Space, and Technology Committee about "Maintaining U.S. Leadership in Science and Technology." Representatives from the national academies of sciences of the G20 countries handed over recommendations for improving marine conservation to the Japanese Prime Minister Shinzō Abe today in Tokyo, for later consultation at this year's G20 summit. The statement was jointly drafted by the G20 National Academies of Sciences under the leadership of the Science Council of Japan. The G20 summit will take place on June 28 and 29 in Osaka, Japan. The Gulf Research Program of the National Academies of Sciences, Engineering, and Medicine today announced a new funding opportunity to provide up to $2.5 million in grants to foster innovative approaches that support its ongoing efforts to improve understanding and prediction of the Gulf of Mexico Loop Current System. A new report from the National Academies of Sciences, Engineering, and Medicine reviews current evidence and updates intake recommendations known as the Dietary Reference Intakes (DRIs) for sodium and potassium that were established in 2005. Dietary Reference Intakes for Sodium and Potassium revises the Adequate Intakes (AIs), which are the best estimate of intakes assumed adequate for apparently healthy individuals. The report reaffirms the sodium AI for individuals ages 14-50, decreases the sodium AIs for children age 1-13, increases the sodium AIs for adults ages 51 and older, and decreases the potassium AIs for individuals age 1 and older. The report also uses guidance from a 2017 National Academies report to introduce the first DRI specific to chronic disease risk reduction. A new report by the National Academies of Sciences, Engineering, and Medicine recommends that the U.S. Intelligence Community make sustained collaboration with researchers in the social and behavioral sciences a key priority as it develops research objectives for the coming decade. A new report from the National Academies recommends changes in the way that the U.S. Department of Energy manages science and technology (S&T) development in order to accelerate the cleanup of radioactive waste and contaminated soil, groundwater, and facilities at U.S. nuclear weapons sites. A portion of DOE's technology development should focus on breakthrough solutions and technologies that can substantially reduce schedules, risks, and uncertainties in the cleanup, the report says. This effort should be managed by ARPA-E, a DOE division that has a record of investing in innovative solutions for complex technical challenges; it would require substantial new funding, along with a different model for managing research and stimulating innovation. In light of the many costs generated by child poverty for the United States, a new report from the National Academies of Sciences, Engineering, and Medicine provides evidence-based policy and program packages that could cut the child poverty rate by as much as 50 percent and increase employment and earnings among adults living in low-income families. A new report from the National Academies offers guidance to the U.S. Environmental Protection Agency to inform the next revision of a permit program that requires industries to manage stormwater to minimize discharges of pollutants to the environment. The report recommends several ways that EPA can strengthen the Multi-Sector General Permit (MSGP) program to provide its intended environmental protection while balancing the overall burden of monitoring on industry. Ten years ago, Academies of Sciences, Engineering, and Medicine released Strengthening Forensic Science in the United States: A Path Forward. This landmark report stimulated a national discussion about the need to reform forensic science, fostered a re-evaluation of how forensic evidence is reported in court, prompted increased funding for forensic science research, and inspired reforms in practice and procedure for forensic science professionals. The report also led to re-examinations of forensic techniques that are frequently used in criminal investigations. Susan R. Wessler, distinguished professor of genetics and Neil and Rochelle Campbell Presidential Chair for Innovation in Science Education, University of California, Riverside, has been re-elected as home secretary for the National Academy of Sciences. Wessler will continue to be responsible for the membership activities of the Academy during her third four-year term. In addition, four members have been elected to serve on the Academy's governing Council for three years. All terms begin July 1. •	Ruth J. Williams, distinguished professor of mathematics and Charles Lee Powell Chair in Mathematics I, University of California, San Diego. In a new Nature commentary, NAS President Marcia McNutt and several colleagues make the case for the creation of a U.S. advisory board for research integrity and quality, which would be "a central resource to which institutional leaders and other members of the scientific enterprise could turn for assistance in creating and sustaining cultures for reliable and efficient research." The National Academy of Engineering has elected 86 new members and 18 foreign members, announced NAE President C. D. (Dan) Mote, Jr., today. Election to the Academy is among the highest professional distinctions accorded to an engineer. Renewed interest in exploration of the moon has the potential to benefit lunar science greatly and could evolve into a program facilitated by partnerships between commercial companies and NASA's Science Mission Directorate (SMD), say companion reports by the National Academies of Sciences, Engineering, and Medicine. However, the two reports find that the activities undertaken to date, although aligned with community consensus for lunar science priorities, do not replace missions recommended in the National Academies' most recent planetary science decadal survey and remain subject to many unknowns, such as the ability of standardized commercial lunar landers to interface with complex science payloads. Marcia McNutt, C. D. Mote, Jr., and Victor Dzau share their outlook for the National Academies of Sciences, Engineering, and Medicine in 2019. The National Academy of Sciences is presenting its 2019 Public Welfare Medal to agricultural scientist, policymaker, and visionary leader Agnes Kalibata "for her work to drive Africa's agricultural transformation through modern science and effective policy, helping to lift more than a million Rwandans out of poverty and scaling impacts for millions more African farmers." The medal is the Academy's most prestigious award, established in 1914 and presented annually to honor extraordinary use of science for the public good. "Agnes Kalibata has long championed science and evidence as the basis for practical agricultural policies that have transformed Rwanda to a model of prosperity and security," said Marcia McNutt, president of the National Academy of Sciences. "Her actions exemplify science as a powerful force for growth and well-being, and we are thrilled to present her with our highest award." The National Academies established the Climate Communications Initiative (CCI) last year to enable their extensive work on climate science, impacts, and response options to inform decision-makers and the public more effectively. A new strategic plan, which will guide the CCI's efforts going forward, has been developed by an external advisory committee, in cooperation with an Academies staff team. The advisory committee -- composed of experts in climate science, public and environmental health, science education, communication research and practice, brand strategy, industry, policy, and decision making -- will provide ongoing advice as the Academies implement the plan. The National Academy of Sciences will honor 18 individuals with awards in recognition of their extraordinary scientific achievements in a wide range of fields spanning the physical, biological, and medical sciences. The awards will be presented at a ceremony on Sunday, April 28, during the National Academy of Sciences' 156th annual meeting. For upcoming reports & events read our monthly tipsheet. Register here to receive news releases and advisories on the subjects that interest you (news media only). The Proceedings of the National Academy of Sciences news office website can be found here. Inquiries should be sent to PNASnews@nas.edu. Read the latest Report to Congress, which details the National Academies' work in 2017.